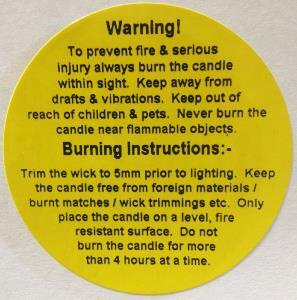 Quick and easy to apply Candle Warning label, 49mm diameter. If your hand crafted labels are being sold or given to family and friends they must have a candle warning labels applied by law. The labels are printed black on yellow semi-gloss paper. To prevent fire & serious injury always burn the candle within sight. Keep away from drafts & vibrations. Keep out of reach of children & pets. Never burn the candle near flammable objects. Trim the wick to 5mm prior to lighting. Keep the candle free from foreign materials / burnt matches / wick trimmings etc. Only place the candle on a level, fire resistant surface. Do not burn the candle for more than 4 hours at a time.